You are here: Home / the hotbox / iMediaSpot / iMediaSpot: Holy Unconventional Marketing, SFBatKid! Posted by: Michelle Batten on November 21, 2013 in iMediaSpot, the hotbox Comments Off on iMediaSpot: Holy Unconventional Marketing, SFBatKid! For the last year, everyone has been talking about ‘the Oreo moment’ and how to make their marketing more ‘real-time’ in order to seize opportunity during live events with the hopes of going viral. Now, the Make-A-Wish Foundation has shown us how to unleash your brand purpose and create a memorable real-time experience that doesn’t feel much like marketing. What it was: a five-year-old cancer fighter named Miles Scott got to live out his ‘Make A Wish’ dream to be Batkid for a day as San Francisco, CA was transformed into the legendary Gotham City. The crime fighting day wish experience consisted of cruising in the Batmobile, rescuing a damsel in distress and battling both the Riddler and the Penguin along with several other standard superhero duties. According to the SF Business Times, #SFBatKid campaign returned more than 522,000 tweets, reached more than 750 million people and received 1.74 billion impressions and caused a flood of donations that took down the website for a short period. Why it’s smart: SFBatKid exemplifies the heart and soul of a brand at work – it turns marketing on its very head by enabling the audience to have a front row seat and be part of a little boy’s wish experience as it unfolds – LIVE. Over 11,000 volunteers and spectators following the ‘caped crusaders’ quickly became invested brand ambassadors for Make A Wish, personally sharing Miles’ story through social networks in a way that transcended anything traditional media could have done alone. The face of their cause became very real to millions more people globally that were drawn in to #SFBatkid through Instagram photos, tweets, YouTube clips and more– including entertainment, sports and political celebs. Drop the Rope and Market from the Inside-Out – most of us build our marketing with the following flow – please donate, give followed by thanks and here is what your funds supported. In this case, I think MAW did a great job of flipping things around. They started by showing the actual product being delivered (the end or insides of getting your wish/being a volunteer) FIRST, followed by all the reinforcement marketing tactics that got individuals inspired to then support and build awareness (the beginning or outsides). Make Your Audience Part of the Show: MAW took things one step further by making their campaign a highly participatory event – there was all kinds of action which generated a host of ways for volunteers and spectators alike to contribute while simultaneously enjoying Miles’ wish experience up front as well as from afar via the hashtag #SFBatkid. Capture and Curate the Action: So often we as marketers go to all the trouble to stage really fantastic events, but don’t take the equal care to fully harvest the fruit of our endeavors. The #SFBatkid team made sure to film, snap, record and share moment by moment through all means of social and traditional media channels. With all of the technology we have at our disposal, our marketing experiences must continue to evolve with it. Make-A-Wish has certainly raised the bar – making unconventional marketing the new standard in my playbook. 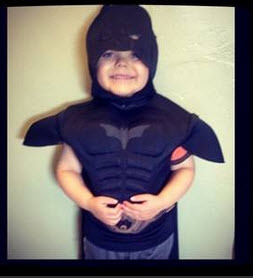 Way to go, SFBatkid! Check out HLNTV for photos from #SFBatkid series of fantastic exploits.